Now it came with a link to Vimeo to what I thought would be a preview clip. Turns out it was the whole episode (albeit not quite ready for broadcast, presumably so we wouldn't nick it). So I set aside some time this morning and watched it (heck as spam goes, sneak previews of shows I watch beats the usual assortment of casino and male enhancement offerings). Now this particular episode is going to look at what causes solar storms and their effects on Earth. Phil Plait of Bad Astronomy fame hosts (but doesn't narrate) the episode and conducts the virtual tour of the Sun. Going deep into the Sun's core to explain where the Sun's energy comes from, then moving out through the convection zone to the surface, Phil shows how the energy from the core is transported to the surface and causes the Sun's impressively complex magnetic field. He further goes on to explain how this magnetic field goes on to create Sunspots and solar storms and that these storms through massive amounts of energy and matter into space. Now the level of detail in the explanation is quite low, but given the level of scientific literacy in North America, I suspect this is to keep the level of understanding within the grasp of the general public (it has only been in the last decade that space sciences was returned to the Alberta science curriculum), though I think a little bit more as to which element is used and which is formed could have been thrown in without much confusion in the general public. Other than that, Phil presents a good general overview of the process. Other experts also provide insight into the effects of these solar storms if they're aimed at the Earth. The effects on the atmosphere and the Earth's magnetosphere are shown and how this can affect us is discussed. The information is factual and as presented by the experts fairly clear. Now those of you who I have as friends on Facebook know that one of my pet peeves is how the media sensationalizes solar storms. Over the past year or so there have been a few stories that basically proclaim that some solar storm or another will blast our electrical infrastructure into the stone age and how basically we're all doomed. This drives me to distraction. Once every 11 years the Sun's activity increases, causing these storms to happen and amazingly despite this fact we're still here. Now this shouldn't downplay the danger of extremely large storms as these storms can cause disruption of unprepared electrical grids and the devices hooked up to them, but it's important to point out that they happen all the time with only minor effects to our world. As an example as we head to solar maximum in the next year or so the frequency of Coronal Mass Ejection (CME) warnings I get from the Solar Influences Data Centre in Belgium have been increasing to a few a day. These CME's are the rush of particles from one of these storms and if the Sun is pointing at us when they happen it sends them our way, hitting us about 48-72 hours after leaving the Sun. This shows that the vast majority of these events are fairly non-disruptive and not worth spooking the public about. Yes we need to worry about a big one, but we don't need to worry about everyone that comes along. What are the dangers of sensationalization? Well eventually the public loses interest due to the "boy who cried wolf" factor. Each time the media pushes the "wipe out humanity" angle to sell papers, and lo and behold it doesn't happen, more and more people start tuning it out so that when the actual large event that can cause harm happens people ignore that as well. In this case people also includes those that run the power utilities and our governments. When these people become desensitized to the problem, we're all in danger. So how does Curiosity handle this? Well the scientists and engineers present it like, well scientists and engineers. Basically yes this could happen, we're generally unprepared for it and we should do something about it. The voice over announcer on the other hand does tend to sensationalize the case of the fall of civilization over such an occurrence. While it is true that the last truly large CME to blast Earth was in the 1920's when we were less dependent on electricity and electronic communication, we were still dependent on it then. By the 1920's radio was an important communication tool and the large industrialized cities of the world were made possible by the use of electricity to run everything. Telephone communication was actually more vulnerable in the 1920's than now as back then phones used wire to connect cities far away. Today we use fibre optics which are immune to the problems caused by solar storms. The only electrical device we use today that wasn't available in the 1920s is the computer. Naturally the computers of a large nation being taken out would be crippling for a while, but it wouldn't end civilization. I say this in that we have had large power blackouts in the past caused by either solar activity and failures in the electrical grid. Though things were rough for a few days, society didn't collapse. Most critical infrastructure has backup power in the event that the power does fail (and it does fail for more mundane reasons than solar storms). The grid does have systems to compensate and since the 1989 Quebec blackout, power companies have been hardening their systems against the problem. This doesn't mean we shouldn't be vigilant and do what we can to further harden the systems that could be effected but it also means we don't need to panic the public over and over again to the point where they no longer care. Curiosity also fails to mention the fact that our current solar cycle is, in terms of previous solar cycles rather quiet. This cycle is likely to have a peak sun spot number well below previous ones. This means the Sun is quieter during this cycle that it has been in the past. This also means that a massive grid killing storm is also less likely as the energy needed may not be present (there is some evidence that the solar dynamo is winding down towards another Maunder type minima, I talked about this previously here). This means that though previous cycles were more violent, large "killer" storms didn't occur, even though they were more likely to happen. Again this doesn't mean we shouldn't be vigilant, but we do need to keep things in perspective. So should you watch it? 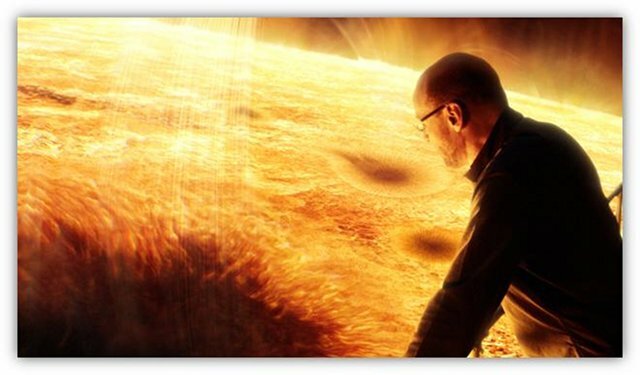 Sure, it provides a light overview of solar physics and ways the Sun affects us that most people don't think about. So if you've got an interest in how the Sun works and don't know where to start, check it out. According to the Discovery Channel this episode of Curiosity is set to air on the 30th of December 2012 at 9pm EST/PST in the U.S. Naturally Discovery Canada will show the episode sometime after that (they're website doesn't go far enough into the future to figure out when) so you'll have to keep an eye on their listings.